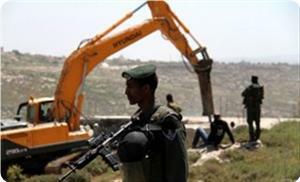 On July 21, bulldozers of the Israeli occupation forces (IOF) destroyed a water well near Khader village, in the southern West Bank. Construction of the well was financed by the European Union (EU). Ahmed Salah, coordinator of the popular committee in Khader, said that the EU-financed well was meant to help in reclaiming village land. Water is life anywhere, but especially so in the Middle East. Without it, crops wither, villages lose their means of survival, and eventually people have no choice but to leave. Apparently Israeli authorities plan to clear the area for a park. Salah added that the IOF bulldozers went on to vandalize vast tracts of cultivated land and crops recently harvested for market. In nearby Khilat Um El-Fahm hamlet, the IOF destroyed a storage building filled with crops ready for sending to market, and at nearby Edhna village, they destroyed a water well and three greenhouses. The thing that caught my eye in the Khader report is the fact that the well was financed by ‘aid’ from the European Union. The occupied West Bank is littered with such projects, some of which I saw on my travels for Our Way to Fight – wells, cisterns, roads, solar panels. They are routinely destroyed by the Israeli army. Complaints are lodged routinely by EU officials with their Israeli counterparts. EU officials claim they’re doing their bit, another aid cheque is sent off, and so it goes. Official criticism of Israel remains circumspect at best, and sanctions out of the question. This is a bitter reminder of what a fantasy it is to imagine that, as things stand now, international ruling elites will force Israel to end its illegal occupation. As long as it suits their larger purpose – business as usual – the destruction of Palestine will continue. But then the same could be said of apartheid in South Africa. International ruling elites defended, financed and armed the apartheid regime for decades, comfortably oblivious to side issues like compassion, reason, ethics or international law. After many years of steady organizing work by grassroots activists in South Africa and other countries, eventually for international elites the cost of apartheid outweighed the profit. While I still believe that individual support is vital to grassroots organizations working for justice and freedom in Palestine and Israel, BDS – the international movement for boycott, divestment and sanctions – remains our single best hope for raising the cost of Israeli apartheid until finally it outweighs the profit. For the latest news on BDS, check here.